Newcastle Vaults is a safe deposit box facility which is part of a larger group of facilities with vaults in Ireland, Scotland and England. We are a member of the Safe Deposit Federation (SDF), this ensures that we meet the highest standards in service, security and privacy. We offer a number of different safe deposit boxes and sizes. As most major Banks are no longer offering a safe-keeping or safe deposit box service to their customers, individuals and companies now more than ever need to secure valued possessions, documents and cash safely and securely. Newcastle Vaults is part of a larger collection of vaults including Glasgow Vaults Scotland and Merrion Vaults Ireland – the largest independently owned safe deposit box centres in both countries. We offer safe-keeping services to private individuals and businesses, allowing the safeguarding of their most valued possessions in a secure state-of-the-art purpose-built vaults. Our Vault facilities offer safe deposit boxes and lockers in various sizes to suit all client requirements. Smaller boxes are perfect for the storage of cash, jewellery, precious metals, valuable coins and computer back-up discs. The mid-size boxes are designed to keep documents and papers, house deeds and other important items. The large boxes would be ideal for luxury watch collections or jewellery items in-boxes, and are designed to hold larger amounts of valuables, paperwork and even artwork which need to be stored securely. We are also the only safe deposit box company to offer high security private walk-in vaults for the storage of fine Art and/or valuable furniture. We are situated in Cloth Market, in the centre of Newcastle. We aim to provide a unique and five star service to our clients, ensuring the safety and security of their most valued possessions, documents, jewellery and irreplaceable items. Newcastle Vaults, Glasgow Vaults & Merrion Vaults were founded by Séamus Fahy and David Walsh. Séamus Fahy studied business at the University of Limerick before becoming an oil and equity trader. In 2008, he set up Voltaire Diamonds, a leading provider of engagement rings and diamond rings. 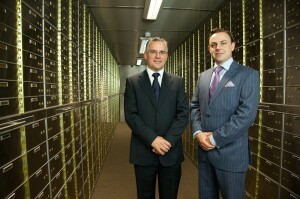 He first spotted an opportunity for the provision of Safe Deposit Boxes to the public in Dublin.